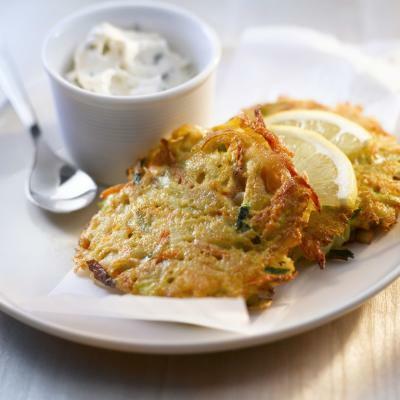 Flavoured with garlic and paprika, these rosti are perfect to serve for brunch or breakfast. Shred potatoes using the largest holes on a box grater; spread the potatoes out in even layer on large kitchen towel. Roll towel into log; position towel over the sink and twist to squeeze out as much moisture as possible. Transfer potatoes to large bowl; mix in garlic. Sprinkle with salt and pepper; toss to coat. In large, nonstick skillet, heat half of the butter and oil over medium-high heat; drop 1/2 cup (125 mL) portions of potato mixture into skillet. Spread each portion into thin pancake; cook without disturbing for 4 minutes per side or until golden. Transfer to paper towel–lined plate. Repeat with remaining butter, oil and potato mixture. Meanwhile, fill saucepan with enough water to come 3 inches (8 cm) up side; stir in vinegar and bring to gentle simmer. Break cold egg into small dish or saucer. Holding dish just above simmering water, slip egg into water. Repeat with remaining eggs. 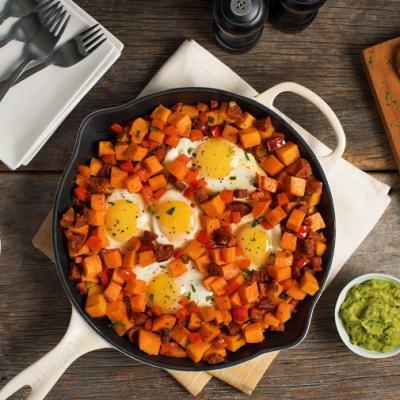 Cook, in barely simmering water, for 3 to 5 minutes or until whites are set and yolks are cooked to as desired. Remove eggs with slotted spoon; drain well on paper towel. Topping: In skillet, heat oil over medium-high heat; sauté spinach until just starting to wilt. Season with salt, pepper and nutmeg. 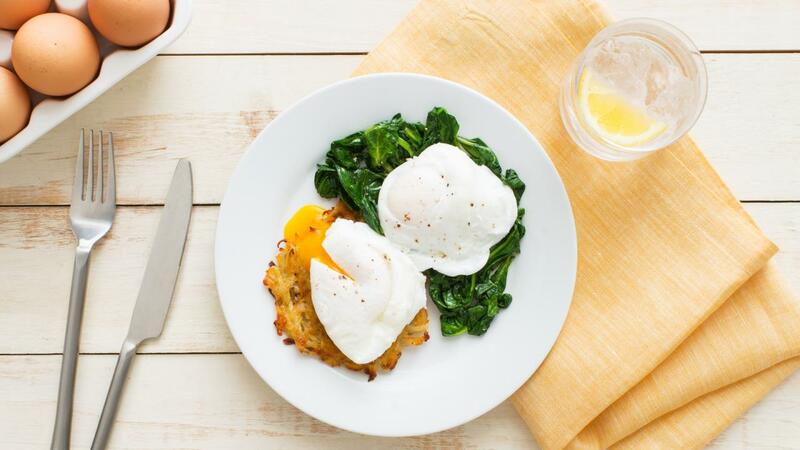 Divide spinach evenly over rosti and top with poached eggs. Sprinkle with paprika. Tip: If desired, serve with bacon.